Do you want to serve your little one only the best foods but feel it can become a bit overwhelming at times? This doesn’t have to be the case with the versatile Baby Bullet! This product helps you give your baby the best nutrition it needs to set the stage for a lifetime of health and wellness! The baby bullet food processor has 2 blend blades for mixing soft or textured foods. Its 3-piece batch bowl is perfect for blending large quantities of baby food. This set comes with 6 date-dial storage cups that help you keep track of the foods preparation date. You can organize these cups in the spill-proof storage tray it comes with. 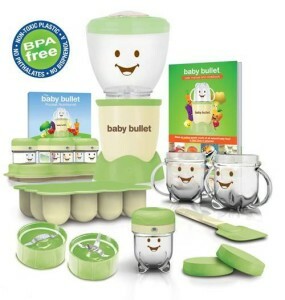 The Baby Bullet complete baby care system comes with small cups with re-sealable lids to keep the food fresh while traveling. There is even a milling blade that rice, grains and oats into fine cereal powder for your baby. This food system comes with a user manual and cookbook with simple techniques to make healthy baby food. Never buy baby food for your little one again!! This system is incredibly easy to use and the perfect addition to any registry! Not only is it a complete food system but It also includes a pocket nutritionist that lets you plan a healthy diet for your child. To buy one you can head over to the Baby Bullet page and grab one for $59.99. I think it was the baby oatmeal stuff.